The Sony Xperia S is well versed in modern connectivity. It doesn't have LTE like the Xperia ion, but it does have quad-band 2G and 3G. Mobile data speeds are boosted by 14.4Mbps HSDPA and 5.76Mbps HSUPA. Local connectivity is covered by Wi-Fi b/g/n and DLNA, so you can easily play media (photos, videos, music) from DLNA-enabled storage devices or push content from your phone to a DLNA TV or music player. A dedicated app, Media Remote, will serve as a remote control for DLNA-capable BRAVIA TVs and Sony DVD/Blu-ray players too. It has a few versions of the interface ranging from simply changing the channels to mouse input and viewing disc history. The Media Remote app is available for free download at the Play Store so other droids can use it too. Bluetooth is also onboard the Xperia S, but the boring 2.1 version. Then there's NFC support - you can use it to read NFC tags but also make the phone act as a tag itself. You can create multiple tags and choose which one you want to share. A tag can be anything from contact info (usually yours so you can send it as a sort of wireless business card), a URL or just plain text. The Xperia S saves NFC tags you've scanned with it and you can even star some of them for easier access later. You can also use the Sony Smart Tag accessories, which can be set to trigger different actions - there's a long list of options available and multiple actions can be triggered at once by one tag. To streamline the process, you can use the Smart Tags widget. You can give names to tags to help you remember where you placed each one (the tags in the box are Home and Bedroom by default). Here are some of the actions available: control Wi-Fi, Wi-Fi hotspot, Bluetooth, GPS, sound mode, you can have the phone open a URL, play a track, send a text, enable text to speech, change the wallpaper or launch an app. Here's an example of what you can do with a Smart Tag - a tag in your car can switch on Bluetooth so the phone hooks up to the car audio, enable GPS and launch the SatNav app and enable text to speech, which will read incoming texts out loud. And we're not done yet - the Sony droid has a microHDMI port so you can easily play those FullHD videos and show off the 12MP photos on an HDTV. There's a twist too - there's a dedicated TV launcher that is easy to use on a big screen. We say on the big screen because you don't have to use the phone's touchscreen to control the launcher (you can if you want to). Compatible TVs (we're not sure which TVs are) can talk back to the Sony Xperia S, so you can use the TV remote to operate the launcher. There's plenty of functionality available here - you can browse the photos and videos in the Gallery, use Sony's Video Unlimited and Music Unlimited, browse the web or launch Facebook, check Gmail or use any installed app really (you can just add its shortcut to the list). And since typing with the remote isn't very handy, you can use voice search. 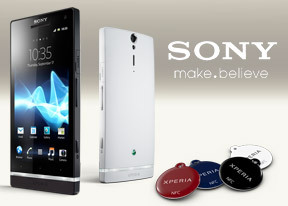 The Sony Xperia S has a microUSB port with USB On-The-Go support. We tried hooking up various accessories - flash storage worked, but pairing up with other phones in Mass Storage mode was problematic (especially if the second phone supports USB OTG too), we even tried a USB keyboard and it worked (but a USB mouse didn't). One more connectivity feature before we're done - the Xperia S has a built-in A-GPS receiver, which also works with GLONASS. This can give you faster locks and better positional accuracy, especially in dense urban areas. The user interface of the browser is simple, with almost no visible chrome by default. Once the page loads, all you see is the URL bar and the bookmark button at the top of the screen. Once you zoom in and pan around though even that disappears (scroll to the top or press menu to bring it back). That way you have the entire 4.3" screen for web browsing. And with 720p resolution, desktop sites fit comfortably on the screen and text remains legible even at low zoom. The browser supports double tap and pinch zooming, along with the dedicated virtual zoom buttons. There's text reflow, which reformats text so that it best fits on the screen. The browsing performance is excellent - panning, zooming and the text reflow are blazing fast. The minimalist UI is quite powerful - hit the menu key and six keys pop up. You can open a new tab, switch tabs, refresh the page, go forward, and open bookmarks. The last button reveals even more options (text copying, find on page, etc.). One of the important features in the web browser is the full Flash 11 support. YouTube videos played smoothly all the way up to 1080p - no dropped frames, audio lag or video artifacts. Flash games played trouble free too. The Sony Ericsson Xperia S comes with a solid set of organizing options, including a document viewer. The app in question is OfficeSuite and it has support for viewing document files (Word, Excel, PowerPoint and PDF, including the Office 2007 versions). For editing, you will need to get the paid app. Reading documents is quite comfortable on the high-resolution screen and panning is blazing fast. There's built-in file browser and integration with cloud storage (Google, Dropbox, Box). The Calendar also pulls info on upcoming events from your Facebook account. Facebook events appear just like regular calendar entries but you can't edit them on the phone, they are read-only. There is also a calculator aboard. It is nicely touch optimized - the buttons are really big and easy to hit. You can pull out advanced functions (trigonometry, logarithms) by turning the phone sideways. The app has also grown a World clock along with stopwatch and timer functionality, which were missing in previous Xperia phones. The Power Saver app helps you extend your battery life by toggling things like Wi-Fi, GPS, Bluetooth screen brightness, auto sync and background data on and off automatically when the battery charge falls below a certain user-defined threshold. There are three presets in total. The other two are a manual power saver and a timed saver. The latter can, say, keep all those power-hungry features off for the night and turn them back on in the morning.